This is another book I got as a present, back in 2008 this was the gift you received if you went to the Library between October 17th and November 14th as part of Nederland leest (The Netherlands Read). Apparently I went there during that time, I must have had a library card at the time or I wouldn’t have been able to get this book. I can’t really remember it. The book has always stayed with me. Just like the book by Saskia Noort. The reason why this book has always stayed with me is because the topic intrigued me. ‘Twee vrouwen‘ means ‘Two women‘, which is why it intrigued me. It was supposed to be a book – first published in 1975 – about a stormy love affair between two women. A topic which was quite controversial at the time. It’s now forty years old, so maybe controversial back then was just the mere fact that it was a love affair between two women. Like I said this is another Dutch book. Maybe that’s the whole problem. I don’t usually read Dutch books, the only time I do anything in Dutch regarding reading and writing is when I am doing something for my job. The rest of it is all in English. So maybe I’m just not used to the way Dutch books ‘sound’? 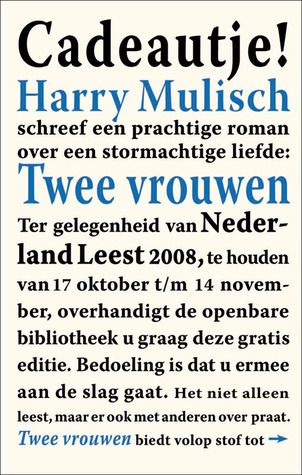 I’m convinced that the problem lays with me, it must be since Harry Mulisch is known as one of the ‘great three Dutch post-war literature authors’. And Saskia Noort is considered one of the best Dutch mystery authors. So the problem must be with me, right? At the same time this is yet another short story. So it could be just the fact that I don’t like the pacing of these short stories. I’m onto a more regular length story from now on. Spoilers ahead, don’t read if you don’t want to know… You’ve been warned! What’s worse than losing the woman you love to the man you used the love? Alfred, who left you – partly because you were unable to give him children. The man who got married to Karen who was indeed able to fulfill that particular wish. And even she wasn’t able to make him stay with her and their children. When he saw Sylvia, the woman you love he wanted to have her for himself. But can it ever really be yours? She could have had any man? Any man in the street to get her pregnant, a no-named man, a one night stand after which she would never have to see him ever again. Why did she choose Alfred, was that as a sort of revenge. Because he left Laura for something she had no control over? And then the ultimate twist in the end. The ending made the story better … but it felt like it had been rushed. To me it felt like he suddenly realized that he had to finish the story because it would be too long otherwise. The reason for starting this reading challenge I’m doing is part of my ‘unclutter my life’ challenge. In an effort to ‘unclutter’ my life (not that my apartment is that messy, but I tend to keep a lot of stuff) I want to try and get rid of things which I don’t use. Books is a good start, I have a lot of them and like I said before there are a lot of books which I haven’t read so in an effort to get rid of them I am reading them so I can judge whether or not I want to keep them. At this point I have read three books which are all going to a new place to live. I’m pretty sure that I won’t read these books again any time soon.